Read about our Roman Holiday below the slideshow. In October of 2000 we traveled to Rome, Italy. While we were there, we stayed at the world-famous Hassler Hotel. The rooms were very nice and the view from the dining room on the top floor was breathtaking. We made side trips to Vatican City for the museums and Saint Peter’s Basilica, to Florence to see Michelangelo’s David and the famous Duomo and to Naples where we saw Mount Vesuvius and Hurculaneum, a first-century village recently unearthed. Top: This is a slideshow of some of our pictures we took while there. Music “Visioni di Roma” composed and performed by Bob. Above: The Hotel Hassler and Church of Trinta dei Monti above the Spanish Steps. Click on image for larger view. 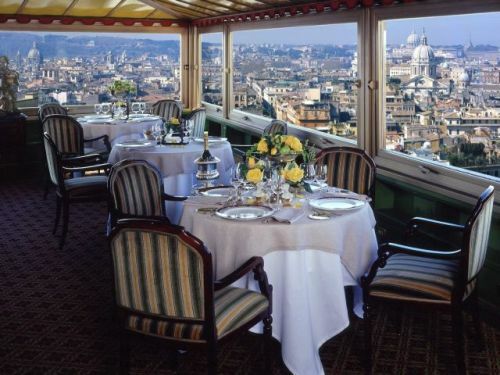 Below: The restaurant atop Hotel Hassler with spectacular Roman view. 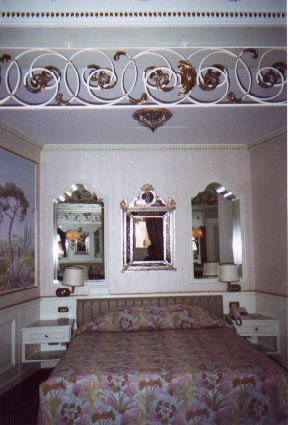 Below: Our nice hotel bedroom at the Hassler.